Well, partially. In yesterday’s YouTube upload, PewDiePie (aka Felix Kjellberg) announced he’ll now be livestreaming each week exclusively on blockchain-based platform DLive, beginning with a stream this coming Sunday, April 14. “DLive is great for me because I’m treated like a real partner, just like all the other streamers on their unique platform,” Kjellberg said in a statement. What does supporting creators in a hugely favorable way look like? To explain that, we need to share a bit about how DLive works. The platform, as mentioned above, is built on blockchain technology. At its core, a blockchain is a public record of transactions made with a currency (you can see an excellent explainer from John Oliver here). Blockchain tech is what powers cryptocurrency, and it’s also what powers DLive’s onsite currency, called Lino Points. Each Lino Point is worth currently worth about 1.2 cents U.S., Variety reports. DLive users can purchase Lino Points using cryptocurrencies like Bitcoin, or with regulated currency through PayPal and video game-focused billing company Xsolla. They can then use those points to subscribe to streamers, or gift points to streamers they like, similar to YouTube’s Super Chat and Twitch’s donations. Where DLive differs from other platforms (and where “hugely favorable” comes in) is in the amount of revenue streamers receive. DLive’s streamers receive 90.1% of the revenue from their subscriptions and donations. (For comparison: YouTube takes a 30% cut of Channel Memberships and a 30% cut of Super Chat donations; Twitch takes a larger 50% slice from channel subscriptions, but doesn’t take a cut from donations.) But the other 9.9% doesn’t go to DLive, either. Instead, it goes into a collective pool that is doled out to the platform’s top streamers each day. Enter Kjellberg. He’s still YouTube’s top creator with nearly 94 million subscribers and is seemingly an integral part of a plan to boost DLive’s growth. Part of the promo surrounding his joining is a MrBeast-style giveaway of between $10,000 and $50,000 in Lino Points to other DLive creators. Those points will be given out during his first livestream, Kjellberg said in his video (below). DLive’s site currently lists Kjellberg as its No. 1 rising star creator. Since his DLive account was announced yesterday morning, he’s amassed 406,000 followers on the platform, and has received roughly $26,000 in Lino Point donations. 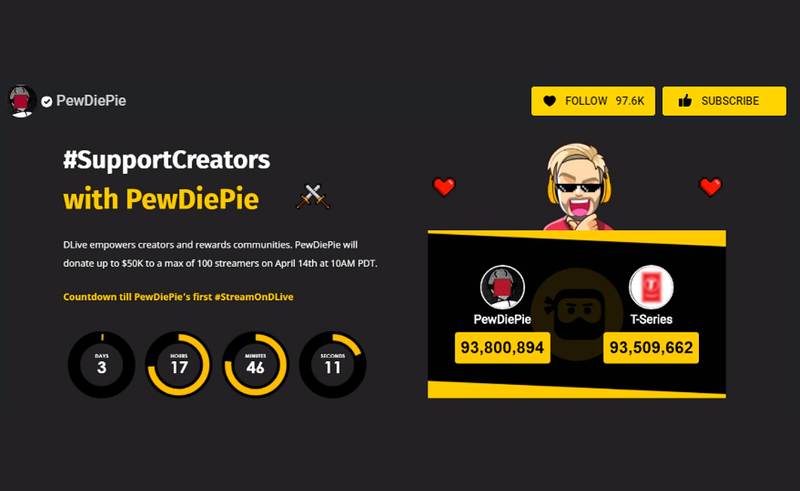 By joining DLive, Kjellberg adds himself to ranks comprising around 35,000 other livestreamers, many of whom focus on gaming, though there are also news, lifestyle, and political streamers. Up until recently, one of those political livestreamers was notorious conspiracy theorist Alex Jones. Last week, DLive (like YouTube, Facebook, and virtually everyone else) made headlines when it banned him.